A primitive ocean on Mars held more water than Earth’s Arctic Ocean, and covered a greater portion of the planet’s surface than the Atlantic Ocean does on Earth, according to new results published today. 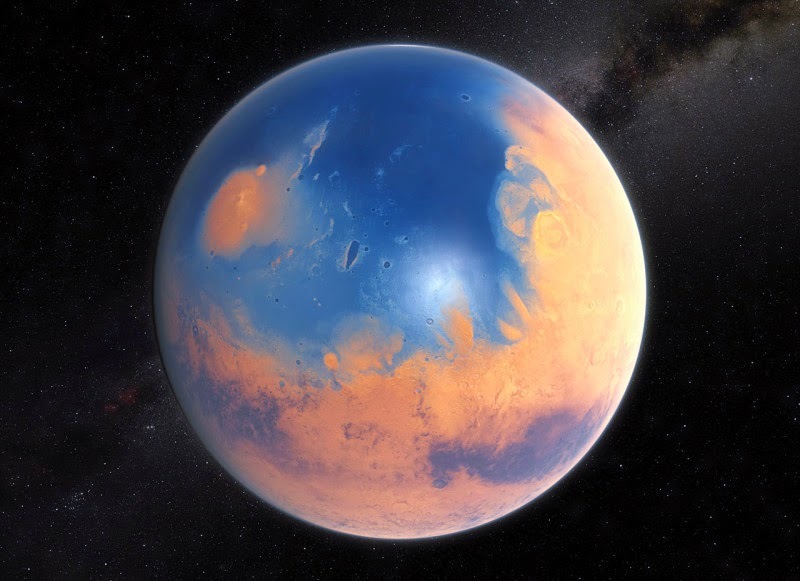 An international team of scientists used ESO’s Very Large Telescope, along with instruments at the W. M. Keck Observatory and the NASA Infrared Telescope Facility, to monitor the atmosphere of the planet and map out the properties of the water in different parts of Mars’s atmosphere over a six-year period. These new maps are the first of their kind. The results appear online in the journal Science today. About four billion years ago, the young planet would have had enough water to cover its entire surface in a liquid layer about 140 metres deep, but it is more likely that the liquid would have pooled to form an ocean occupying almost half of Mars’s northern hemisphere, and in some regions reaching depths greater than 1.6 kilometres. The new estimate is based on detailed observations of two slightly different forms of water in Mars’s atmosphere. One is the familiar form of water, made with two hydrogen atoms and one oxygen, H2O. The other is HDO, or semi-heavy water, a naturally occurring variation in which one hydrogen atom is replaced by a heavier form, called deuterium. The researchers distinguished the chemical signatures of the two types of water using ESO’s Very Large Telescope in Chile, along with instruments at the W. M. Keck Observatory and the NASA Infrared Telescope Facility in Hawaii. By comparing the ratio of HDO to H2O, scientists can measure by how much the fraction of HDO has increased and thus determine how much water has escaped into space. This in turn allows the amount of water on Mars at earlier times to be estimated. In the study, the team mapped the distribution of H2O and HDO repeatedly over nearly six Earth years — equal to about three Mars years — producing global snapshots of each, as well as their ratio. The maps reveal seasonal changes and microclimates, even though modern Mars is essentially a desert. The team was especially interested in regions near the north and south poles, because the polar ice caps are the planet’s largest known reservoir of water. The water stored there is thought to document the evolution of Mars’s water from the wet Noachian period, which ended about 3.7 billion years ago, to the present. The new results show that atmospheric water in the near-polar region was enriched in HDO by a factor of seven relative to Earth’s ocean water, implying that water in Mars’s permanent ice caps is enriched eight-fold. Mars must have lost a volume of water 6.5 times larger than the present polar caps to provide such a high level of enrichment. The volume of Mars’s early ocean must have been at least 20 million cubic kilometres. It is possible that Mars once had even more water, some of which may have been deposited below the surface. Because the new maps reveal microclimates and changes in the atmospheric water content over time, they may also prove to be useful in the continuing search for underground water. Note: The above story is based on materials provided by European Southern Observatory – ESO.